In Highlands County, we are currently establishing a county-wide SWAT Chapter that will consist of several school-based and community-based SWAT clubs. The SWAT Program is adminstered through the Quit Doc Research and Education Foundation. For information contact, Amanda John at AJohn@QuitDoc.com. Secondhand Smoke: Who is at Risk in Highlands County? About 10% of all tobacco-related deaths occur as a result of secondhand smoke exposure. Middle school and high school students in Highlands County report being exposed to secondhand smoke at rates significantly higher than the Florida average. This presentation looks at the risks associated with secondhand smoke, and the impact of clean air legislation on reducing secondhand smokes exposure. Recent surveys reveal that one-third to one-half of all teenage smokers made the decision to use tobacco because it "looked cool in a movie". Most tobacco use in movies functions subliminally by normalizing tobacco use. Since 1990, there has been a dramatic increase in the amount of smoking in movies, especially PG-13 movies marketed to middle-school students. The SmokeScreeners program teaches media literacy skills designed to reduce the influence of movie smoking. Most of these presentations can also be tailored to an adult audience, such as a PTA. 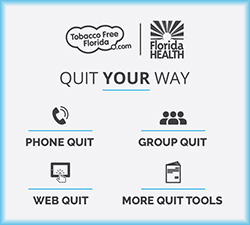 If you are interested in scheduling a program, please contact Amanda John by phone (863-402-1477) or email (AJohn@QuitDoc.com). All programs are free-of-charge within Highlands County.